America has become the new mission field. There are over 120 million unchurched people in the United States making it the largest mission field in the Western hemisphere. Re-missioning churches in North America is about helping churches discover and live on mission to reach our nation for Christ. Jointly sponsored by the Kardia Anglican Church Planting and Remissioning Initiative and the Diocese of the Carolinas, the conference will be a dynamic two day event that is designed to help clergy, church planters, and lay leaders discover and fulfill God’s mission for the local church. Day One will focus on remissioning and Day Two will focus on church planting. The plenary addresses and workshops will explore a variety of issues relating to the mission of the church such as: discipleship, leadership development, outreach, and mission. Speakers include Bishop Steve Wood, Canon Dan Alger, Canon Winfield Bevins, as well as many others. Please mark your calendar and make plans to join us. To find out more information about the event and to register online please click here. Registration is underway for the United Adoration (UA) Songwriting Retreat, September 25-26, 2014, at the Greenhouse Mission Center in Oak Park, IL. 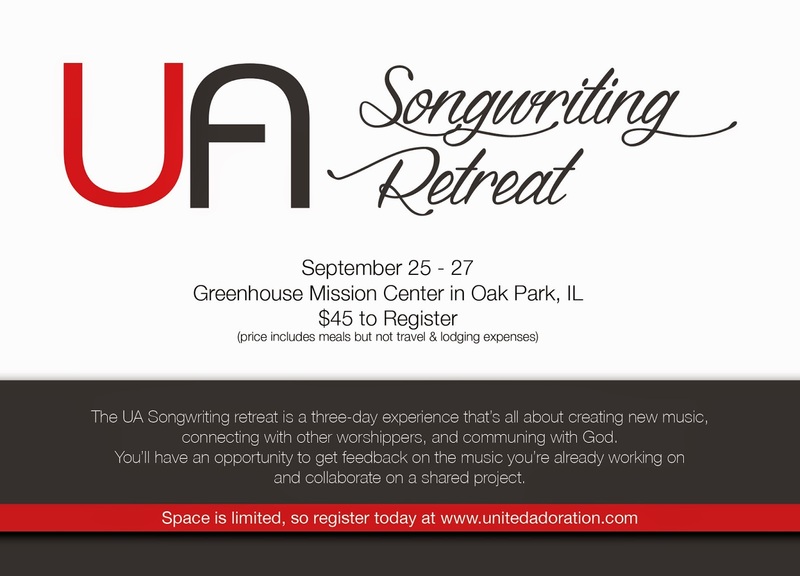 The Songwriting Retreat is an opportunity for worship artists to come together and create fresh music for the liturgical church, while also renewing our creative vision for sharing the Gospel of Jesus Christ in our churches, communities and the world. The retreat is a three-day experience that’s focuses on participants creating new music, connecting with others, and spending time in prayer and worship. Our hope is to inspire one other and to be inspired! Participants will have opportunities to receive feedback on their original music compositions, as well as opportunities to collaborate together on shared projects. The goal of the retreat is for participants to take back to their local congregations a deepened spiritual experience with Christ, as well as new worship music compositions to share in their worship communities. To register, click here. To see the agenda, click here. Need more information? Please click here or email Dave Frincke at dave@heartlandfw.org. Greenhouse is a movement of regional churches in the Anglican Church in North America dedicated to evangelism through church multiplication—bringing the transforming love of Jesus to every people group. We seek to join God’s mission of transformation in his world through the building up of his church both in North America and globally as a unified people empowered to share the good news of his love through word and deed. In pursuit of this vision, we value the raising up of local congregations linked within each region, the release of ministry gifts among laity and clergy for multiplying congregations, and the equipping of movements to reach every people group on our continent with the good news of Jesus.